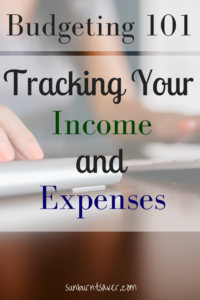 Today we’ll be discussing how to track your income and expenses. You can’t make an effective budget without knowing how much you bring in and how much you take out, so we’re going to come up with a tracking plan anyone can follow. I hope you’ve been keeping track of your expenses too, because we’ll be using your notes to track your expenses! If you’ll remember back in our first post about budgeting, Why Budget?, I asked you to keep track of all your expenses as homework. Hopefully you participated, even just a little bit, in this exercise, because keeping track of expenses is vital to sticking to your budget. No worries if you didn’t, though, because today’s post is all about getting your tracking skills perfected. We’re going to start by tracking your income first, because that’s the most fun part. How much are you bringing in, and how can we get you to bring in more if you’re not making enough? Ready to get started? Let’s take control of our budget! If you receive a regular, steady paycheck from your job, you might look at tracking your income as somewhat boring. Trust me, it’s not! Tracking your income is a vital part of having a successful budget, because knowing what you bring in should dictate what you take out. Plus, if you want to budget successfully, you need to make sure you have leftover savings (i.e. PROFIT) at the end of the month. If you have irregular income coming in, either because you work as a freelancer or you work hourly, it’s even more important to set up a budget to track what’s coming in and going out. 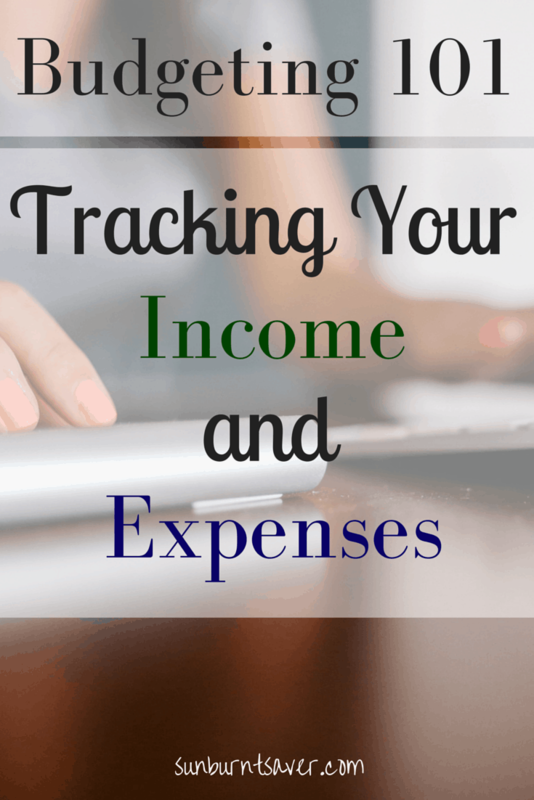 However you get your income, let’s start by tracking it. Side hustle work you do – freelance writing, making money on your blog, etc. Tax refunds – especially around this time of year! With expenses, it can get a little bit trickier. It’s easy to overlook those little expenses, like $5 at the gas station for gum, $20 taken out of the ATM for a quick grocery trip, and soon enough, you’ve overspent. So before we get started tracking expenses, if you haven’t already, grab all your receipts, bank statements, credit card charges, etc. and have them handy. We’ll need them to set up our budget! People who find they need help with keeping track of their receipts and expense finding the best receipt app to help do so. Utilities – water, sewer, gas, electricity, etc. Entertainment – this includes eating out, cost for the babysitter, movies, etc. Personal Care – this includes toiletries, haircuts, makeup, clothes, etc. Misc – pets, hobbies, etc. It looks like a long list, but check over your receipts and statements again. Do you notice you’ve spent something in each category over the last month or two? If not, feel free to delete a category! For example, if you don’t own a car at all, feel free to ignore or remove that category. You may want to make room for a transit fee though, if you use public transit in lieu of a car. Now that we have our categories, it’s time to let the fun begin: tracking what’s going in and out! You can use any method you like: a pen and paper, Mint, Google Sheets, or the tracker I’ll have available for download on Saturday. The easiest way to get started is gathering all your receipts and inputting them on your pen and paper tracking sheet. Once you get a receipt, mark it on your tracking sheet and file your receipt away either in an envelope or accordion file. File your receipt away according to its category: if you’ve just gone to Target to stock up on dish detergent and paper towels, put this in the home care envelope. I personally prefer envelopes to accordion files, but use whatever you like the best or whatever you have on hand. I highly recommend keeping your receipts for 6 months, not only so you can keep track of your receipts and reconcile to your Expense sheet, but also because you never know when you may need to return something! 6 months may sound like a long time, but even if the return period has expired, you can maybe use your receipt to get store credit back. All right, this was a long post, so I’ll let you take a break and get started on your income and expense tracking. For now, just think about what income you have coming in, and set up your expense categories for your budget. If you’re ambitious, take a look at Mint.com and consider tracking your budget using their online tools. On Saturday, I’ll be back with a handy Excel tracking sheet (which you can print out too!). Even though I’m good with my finances I still track my credit card spending. It’s so easy to overspend when using plastic, I just want to make sure I’m not blowing my budget. It’s very easy to overspend with your credit card, isn’t it? I have the bad habit of justifying spending on my credit card as getting reward points for travel, but it’s definitely an excuse I need to drop. Glad to see I’m not the only one who feels that way about plastic!